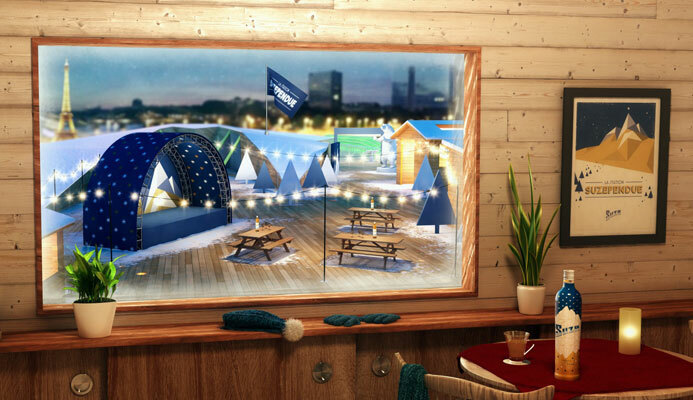 The terrace of the Nuba is transformed into a Station Suzependue this winter, in a ski resort decor, urban and ultra graphic. Inspired by the mountainous landscapes where gentian, the essential ingredient of Suze, grows, the Station welcomes you in a unique and warm universe. Mountain chalets, minimalist pine trees and other decorative surprises have been imagined in the spirit of a winter sports resort in collaboration with artist Elsa Muse. The opportunity to taste some cocktails based on the aperitif created in 1885 by Fernand Moureaux, such as the Suze Spritz or even the Suze of mountains.